A lack of official results did not stop both major political parties from claiming victory in Cambodia’s highest-stakes and highest-turnout local elections to date on Sunday, with the CPP citing its dominance in winning commune chief seats and the CNRP boasting of huge opposition gains in a ballot monitors said was largely free of the irregularities that marred past votes. Unofficial results posted by government-affiliated Fresh News showed the CPP winning 1,163 commune chief seats compared to 482 for the CNRP and one for the Khmer National Unity Party. Those numbers suggest big pickups for the opposition, whose composite parties—the Sam Rainsy Party and Human Rights Party—won just 40 seats in 2012 before merging later that year. But those tallies were thrown into doubt by CNRP Vice President Mu Sochua, who said the opposition had its own preliminary results that differed from the ones offered by Fresh News. “If the margin of error is around 1 percent of votes, we need to ask for a recount,” she said on Sunday, adding that more details for the opposition’s plans would come today. All results remained unconfirmed as of press time, as hosts on state-owned TVK slowly rattled off commune-by-commune results from the National Election Committee (NEC) late into the night. Though the NEC was slated to start announcing results soon after polls closed at 3 p.m., it took hours for the body to begin posting results, with spokesman Hang Puthea blaming faulty wireless internet for the delay. Prime Minister Hun Sen thanked political parties, voters, observers and authorities for a smooth, transparent, “free and fair” Election Day in a Facebook post last night, but did not mention results. CPP spokesman Sok Eysan was more forthcoming. CNRP spokesman Yim Sovann said the fight had never been fair, citing a multi-year government crackdown that saw opposition members jailed and scattered abroad. There were also problems with Sunday’s vote, he said, including disenfranchised garment workers and polling station violations. Cham Bunthet, a political analyst and adviser for the fledgling Grassroots Democracy Party, said that both parties had a point, though he urged caution at taking Fresh News results at face value. At the same time, “it’s a good sign for the ruling party that they could maintain this kind of support” even with high voter turnout, which has historically favored the CNRP. And with former party President Sam Rainsy stuck abroad, the opposition, now led by Kem Sokha, appeared less unified than it had in 2013. The victory “can be taken away easy when you’re not working together, having the same vision, sending the same mission,” he said. Sophal Ear, author of “Aid Dependence in Cambodia: How Foreign Assistance Undermines Democracy,” was less equivocal. “The message ought to be: less stick, more carrot,” he added. Sunday’s election edged out 2013 as the country’s most participatory election in Cambodian history, with the NEC tallying 6,743,329 voters and no province reporting less than an 80 percent turnout. That tops the last election by around 7,000 votes, and the 2012 ballot by over 1.7 million votes. Early reports also suggested it was among the most peaceful and credible elections to date. The NEC logged just one Election Day complaint as of on Sunday evening, according to Mr. Puthea. NEC chairman Sik Bunhok praised the two-week campaign period in spite of threats by Mr. Hun Sen and other senior CPP officials that any CNRP victory could cause war, chaos and death. “The general evaluation found that the political parties conducted the election campaign within a politically mature manner, compromising each other more and obeying the principles of law, regulations and procedures of the election campaign,” he said at a news conference. 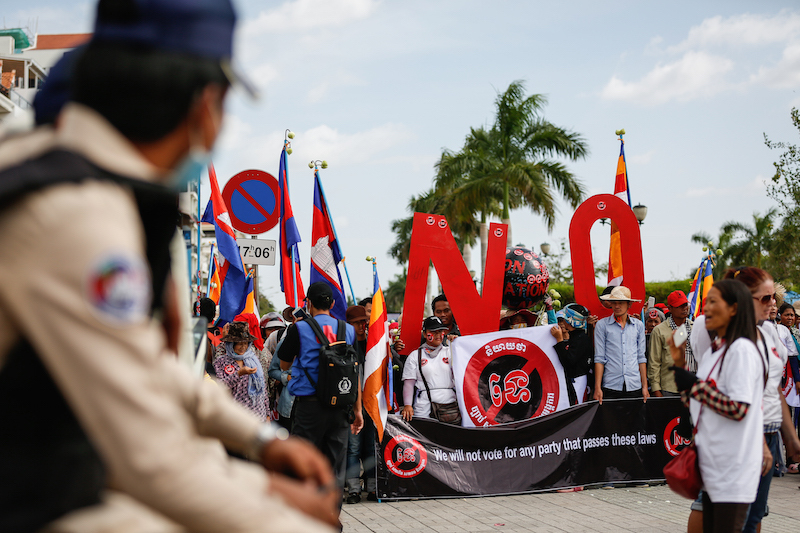 A statement released by a coalition of civil society groups that dubbed themselves “The Situation Room” said the election had largely gone “smoothly, safely and peacefully,” a view that was echoed by Transparency International Cambodia in its own initial news statement. Local and international election observers cited a handful of incidents, including reports currently under investigation by the Committee for Free and Fair Elections in Cambodia (Comfrel) of an influx of hundreds of soldiers voting in a handful of communes as well as a report in Kandal province of threats against election observers in two communes. Among the first to vote was Mr. Hun Sen, who blessed his ballot with a kiss to the box where he cast it at a teacher training center near his sprawling estate in Kandal province’s Takhmao City. “This ink looks like it can’t be erased,” he told reporters after voting, holding his finger aloft. 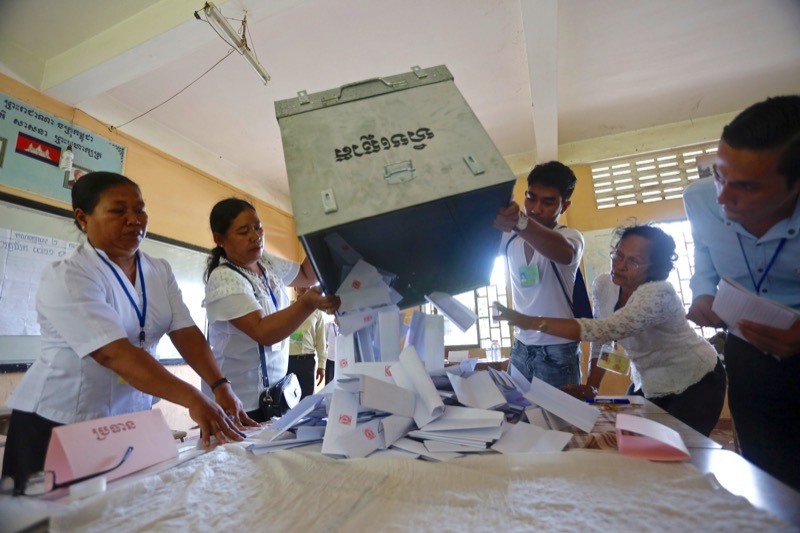 The NEC admitted it purchased the ink from an Indian supplier even after its tests of samples showed it could be removed using a hair care product, sparking concerns among election watchdogs and the CNRP. 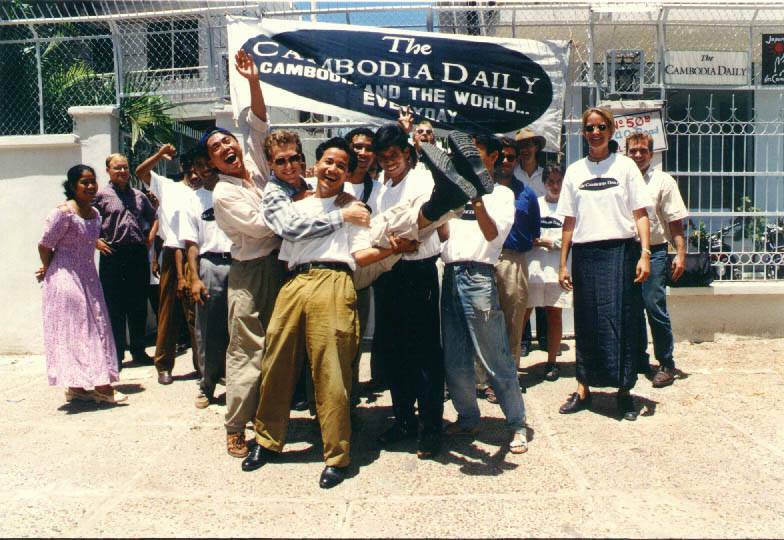 The prime minister then rebuked a foreign reporter with The Phnom Penh Post after the journalist asked Mr. Hun Sen which party had earned Mr. Hun Sen’s vote. “A ‘white eyes’ just asked me who I voted for,” he said, using a phrase used to describe Westerners. “It looks stupid if the foreigner asks questions like that,” he said, adding it was every citizen’s right to keep their choice a secret. Several hours later, CNRP President Kem Sokha cast his ballot at a primary school in Phnom Penh’s Meanchey district. Fresh from a two-week campaign tour that crisscrossed the country, Mr. Sokha said he hoped the party would “get more than 60 percent,” seeming to repeat past predictions that the CNRP would win that share of the popular vote. “I know the strength of our support has increased since the last time,” he said, before seeming to take aim at the prime minister and other top CPP officials who have warned of violence if the opposition takes power. “I believe that people don’t want a villain” in charge, he said. The path that led Mr. Sokha to the polling station symbolizes the party president’s tangles with the law last year. The lawmaker represents Kompong Cham province and used to cast his ballot there, but a series of court cases last year sent him into hiding at CNRP headquarters to dodge arrest. Mr. Sokha briefly left the headquarters in October to register to vote and was granted a royal pardon in December for the charge that had led authorities to seek his arrest. 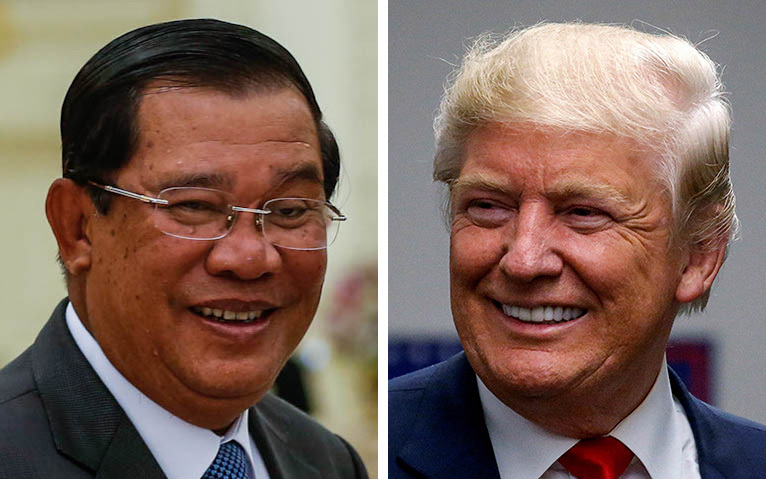 Mr. Sokha and, in a break from past campaign seasons, Mr. Hun Sen, both spoke at peaceful end-of-campaign rallies for their respective parties in Phnom Penh on Friday that mobilized tens of thousands, if not more than 100,000, supporters from each side. 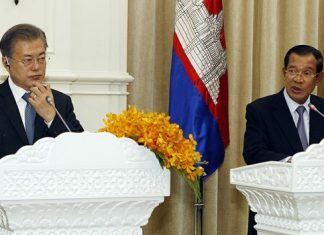 Both leaders returned to old themes, with Mr. Sokha urging change and decentralization and the prime minister warning of war if the opposition took power. That enthusiasm took a more quiet turn at Kolab 1 primary school on Sunday, which hosted five polling sites for Phnom Penh residents of Daun Penh district’s Srah Chak commune. Some 80 percent of voters at one of the five polling sites had already cast their ballot by 11 a.m., according to CPP election observer Thach Kimnhunt. Ms. Kimnhunt and other observers from the CNRP, Comfrel and the Cambodian Youth Federation said the election at the station had proceeded smoothly, with voters largely already aware of the procedures. Health Ministry employee Ieng Siripong, 45, accompanied by his elderly parents, said that he had observed none of the attempts at coercion that accompanied past votes. Voting was also a family affair for 40-year-old Pich Tekim Phean, whose floral blouse matched the one worn by her mother. Uch Theary, on the other hand, said it taken her half an hour to cast her ballot. Mr. Bunthet, the political analyst, predicted the mellow mood would not survive the next year as both parties eyed the crown prize of a 2018 national election victory. “I think there’s going to be a lot of challenges of the vote, a lot of pressure,” he said.